Movie Review: “Mr. Holmes” might not ring a bell for the less attentive, but if the name Sherlock was mentioned somewhere in the title, you would instantly guess that the film is about one of the most famous detectives in our planet. However, the year is 1947, and Sherlock Holmes, magnificently played by Sir Ian McKellen, is long-time retired with 93 years old, getting more and more debilitated, forgetful, and a fusion of emotional and a bit grumpy. Regardless these changes, he’s still polite, efficiently assertive when transmitting information, and conscious about his own errors from the past. 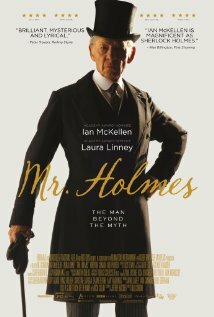 Returned from a recent trip to Japan that brought him good and bad surprises, Mr. Holmes is happy to be at his farmhouse in the English countryside, where he solely has the company of his devoted housekeeper, Mrs. Munro (Laura Linney), and her young son, Roger (Milo Parker). The latter is very clever and shares the same enthusiasm for mystery cases and bees as the detective, who takes pleasure in teaching every detail of beekeeping while stimulates the boy’s perceptiveness about his own writings and those of his ex-partner, Dr. Watson. Nonetheless, not everything is easy, and the old Holmes struggles every single day with his memory and with a particular case that keeps coming to his rusty mind, involving a depressed woman called Anne Kelmot (Hattie Morahan). This is the second collaboration between McKellen and filmmaker Bill Condon, who directs with the same rigor and formalism that he has already accustomed us; the first one was 17 years ago, with the mesmerizing “Gods and Monsters”. Here, the heartfelt story, based on Mitch Cullin’s novel, “A Slight Trick of the Mind”, is more about aging and how to learn from our experiences in life, than really solving a mysterious murder case. For this reason, “Mr. Holmes” might not be a good choice for the ones looking for puzzles and enigmas. It’s not a perfect film, but Mr. McKellen’s performance together with the undaunted message conveyed with gentle, resolute tones, makes it slightly above the average.